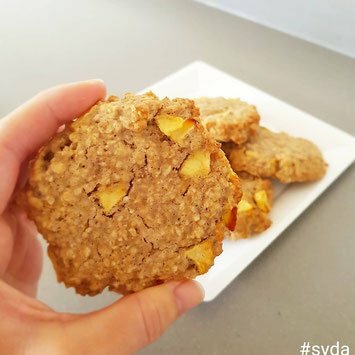 A recipe in which Greensweet erythritol and Greensweet liquid stevia is processed by Stacy van den Abeele for Sweet benefits. 1. In a medium dish, combine the oatmeal, flour, baking powder, cinnamon and salt with each other. 2. In another dish, beat the egg together with the coconut oil and vanilla. then add the milk and the Erythitrol and beat well. 3. Add the mixture to the dry ingredients and mix well together. 4. Cut the apple into pieces and mix well through the mixture. Then let the dough rest for 20 minutes. 5. Make 7 large dumplings if you want large cakes or 15 small ones for smaller biscuits. Press the cookies with a wet spoon. Then bake them in the preheated oven for 15 to 20 minutes. Tip: Before taking them out, first let them warm up in the oven with the lid open.